Such a unique double sided neon sign. 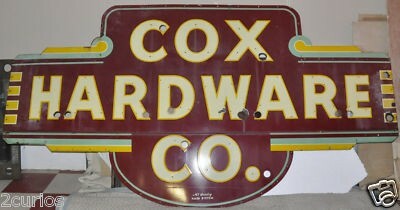 Measuring 106″ by 55″, this Cox Hardware Co. sign is maroon, tan, yellow, and blue. The sign has some nice scripting of lines and bold sans-serif typefaces. This sign is most likely unique since it was made for a company that is not a chain.